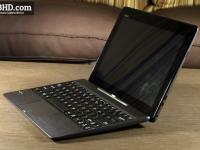 Asus Transformer Book T100TA / T100 review - netbook, reborn! 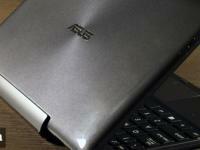 Asus Transformer Book T100TA / T100 review – netbook, reborn! Summary: If you're looking for a 10 inch tablet capable of running all your classic Windows applications, the Transformer Book T100 is one of the best offers for the money. It's not without flaws, but its' cheap and includes a keyboard, so there are plenty of reasons why you'd consider it. I used to cover netbooks on this website a few years ago. They are gone these days, but a new breed of computers now try to fill their shoes: affordable 2 in 1 laptops. The Asus Transformer Book T100TA, or the T100 as it’s known in some regions, is one of these new 2 in 1 devices, and in this post I’m going to tell you if it’s worth your hard earned buck or not. 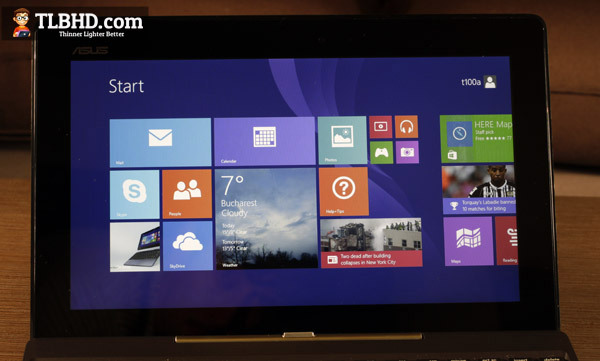 The Transformer Book T100 is basically a compact Windows 8.1 tablet with a 10.1 inch screen. It can work as a stand-alone device just fine, but Asus also includes a keyboard dock with it in the box, handy if you want to use it as a mini-laptop. A simple dock, with a keyboard, trackpad, an USB 3.0 port and only on some versions, a HDD for extra storage space. All these starting for $350. For that kind of money, you can’t expect a fancy looking device. That’s why the fully-plastic body of the T100TA should not be a surprise to any of you. The slate’s rear is smooth and glossy, with a patterned layer hidden just beneath the outer plastic shell. The entire surface is prone to smudges and scratches, but that’s just something you will have to deal with it. The build quality is alright, although the plastic case is somewhat squeaky and the buttons around the sides tend to creak when pressed. In other words, the Transformer Book T100 is not the sturdiest or the most appealing device out there, but it’s definitely not bad either. And it is small and light, as the tablet and the dock weigh each around 1.2 pounds, for a total of 2.4 when having them latched together. The dock is made from a matte, softer type plastic, with a brushed-aluminum like texture on the palm-rest and around the keyboard. 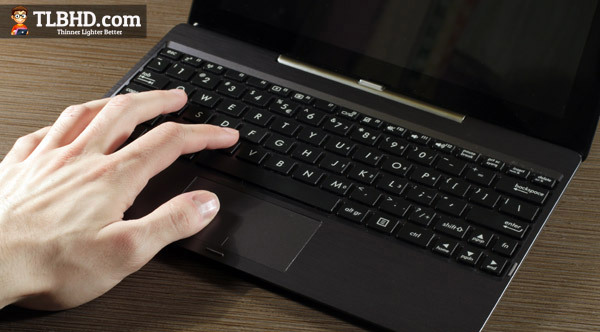 Speaking of those, given how the T100TA is a compact slate, the palm-rest, keyboard and trackpad are rather cramped. Even so, if you do need the USB 3.0 port on this dock or the physical keyboard, you’ll for sure appreciate this accessory, which is included in the box (so you don’t have to pay extra for it). The slate itself can be easily connected and disconnected from the dock, with the press of a single button. And it does offer a fair selection of ports of its own: a micro SD card-slot, micro-HDMI for video output and micro-USB for charging and data transfer. But how does this device feel in everyday use? Well, as a tablet, it’s easy to grab, quite light for a 10 incher and fairly capable. I’ll tell you more about what it can do below in this review. 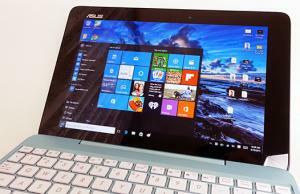 However, Asus went for a lower resolution IPS panel on this Transformer Book T100TA, and while the colors, contrast and viewing angles are alright, the poor resolution is lacking and pixels are visible, especially if you’re used to higher density panels that are available on most modern slates these days. As a laptop, the T100TA feels very small and that might not appeal to some of you. For me, the 10 inch screen is tiny for desk use, despite the fact that the working area is alright, thanks to its 1366 x 768 px resolution. But that’s a very subjective appreciation and you might feel otherwise. The keyboard and trackpad are also shrunk down from what you might be used to on regular laptops. The keys are not only small, but rectangular (not square), with a limited height, so you’ll need some time to get used to them. But the travel and the feedback are better than I was expecting and I was able to write a big chunk of this review on the T100TA without major complaints. The trackpad is tiny and more or less usable. Less because it does get jumpy from time to time, or it occasionally fails to recognize taps. So I ended up not using it that much. More because it’s there when you really need it. 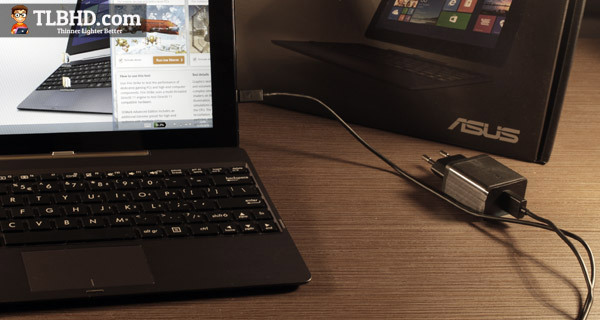 Of course, you can always connect a mouse to this mini laptop, via that USB port, or a suite of other accessories, if you want to. There are a few other things that bother me: the T100TA is a bit top heavy, and in order to prevent it from falling back, Asus decided to limit the screen’s leaning angle. As a result, the hinge only allows to push the screen back to about 120 degrees, which is annoying both for desk and couch use. On top of that, this tablet charges via the microUSB adapter on the right side of the tablet, and the included charging cable is very short (about 1 m /3 ft), which means that using the device while charging can prove to be a painful experience. I should also mention a few things and the speakers and Wireless performances. 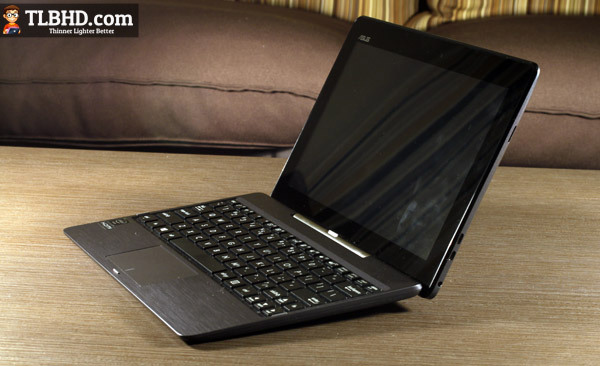 The T100 packs stereo speakers, placed on the back, like with most Asus tablets. They are fairly loud, but will vibrate and distort sound at high volume. Overall though, I’m happy with them. As for the Wireless performance, I can’t say I’ve encountered any issues with this device, although the Wi-Fi module does offer limited performances (speed and range). However, if you’ll have a look on the forums, many complain about Wi-Fi drops with this one, so while that’s not an issue with all T100s, it definitely is something you have to be aware off before buying. 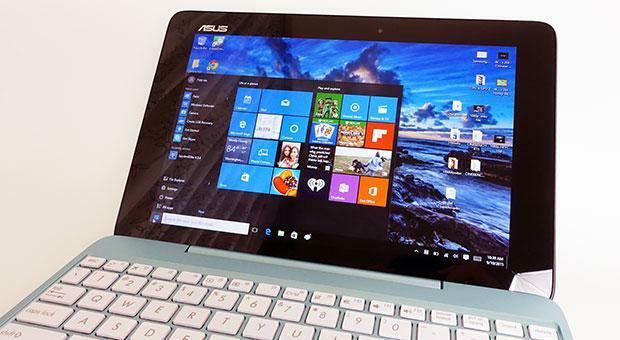 At the end of the day though, the Asus Transformer Book T100TA is not for everyone. But if you’re fine with its plastic body, size and design limitations, it’s well worth more than a look. It can handle everyday tasks well, as you’ll see below and it runs cool and completely noiseless, due to its fanless design. Anyway, let’s turn our attention on the hardware and the software on this device, as these really set it apart from most other 10 inch slates. The Transformer Book T100 is built on an Intel Atom Bay Trail-T platform, with an Atom Z3740 processor, 2 GB of RAM and either 32 or 64 GB of internal storage. Atom platforms are designed with efficiency in mind, so they are not very powerful. In fact, it’s not that complicated to choke the T100TA with some multitasking or demanding programs. However, this Transformer Book will handle fine most everyday activities, like browsing, editing documents, watching movies (including all sorts of FHD content) and so on. 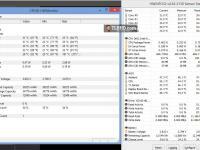 It can handle some multitasking as well and even some classic Windows games. For instance, everything ran perfectly smooth while writing this post in Microsoft Word and having Chrome in the back with a few tabs loaded and Winamp playing some music. So, as long as you don’t plan or running complex software on this device (Photoshop, Premiere, etc) or modern games, the Asus transformer Book T100TA should cope well with your demands. And since it’s running a fully-backed version of Windows 8.1 , it gets access to all the touch-friendly apps in Microsoft’s Store, but also the legacy software you’re familiar with from your other Windows PCs. Of course, when it comes to apps, Android slates and the iPads have a major advantage over all Windows slates. But as long as you don’t have really high expectations (games, highly specialized apps), the T100TA should be alright. In fact, this device is somewhat more oriented towards productivity than other tablets, given the x86 software compatibility, the ports and the included keyboard, but also the Microsoft Office 2013 Home & Student bundled for free with it. But let’s get back to that hardware for a little bit. 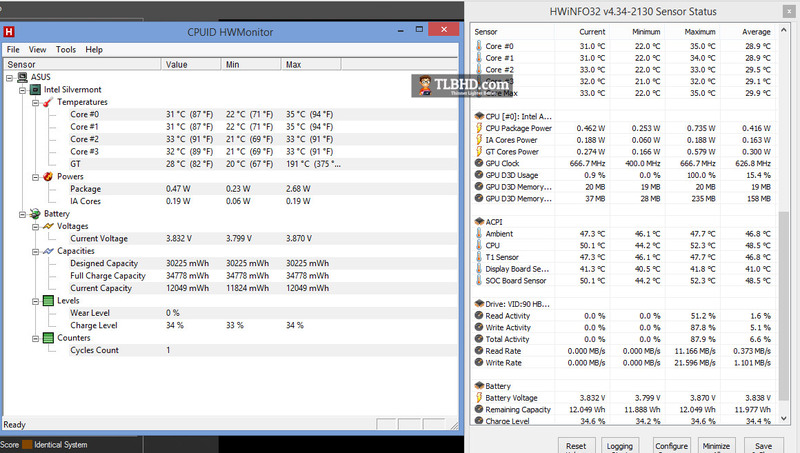 The Z3740 is a lot more capable than the previous Atom processors, although still far from even the base Ivy Bridge or Haswell Core i3 CPUs. The 2 GB of RAM bundled should be OK for casual tasks, but not for more serious activities, and there’s no way to add more RAM on this machine. 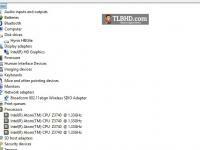 In fact, the T100TA is not upgradeable at all, unlike the older netbooks. The storage space is another aspect worth mentioning, as the T100 comes with either 32 or 64 GB eMMC modules. Add Windows 8.1 and you’ll end up with about 15 GBs of free space on the 32 GB model, and about 47 on the higher-end version. That’s very little and can only be expanded with up to 32 GB microSD cards, but those aren’t that cheap or fast. If you do need the storage space, you can rely heavily on Cloud services, or use some external HDDs. Oh, and Asus does offer a dock with an included 500 GB HDD (7 mm SATA) in some countries around the globe. Intel’s Bay Trail platform might not impress with its performance, however, it does with its efficiency. The T100TA only packs a 31 Wh battery, but it can last for up to 10 hours on a charge, when used lightly. With daily use (a mix of basic activities), it will go for around 8 hours, while when looping a 720p clip, it will run out of juice in about 7 hours. 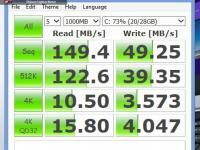 Not bad for a windows machine (the iPads and most Android slates clearly outlast it though). 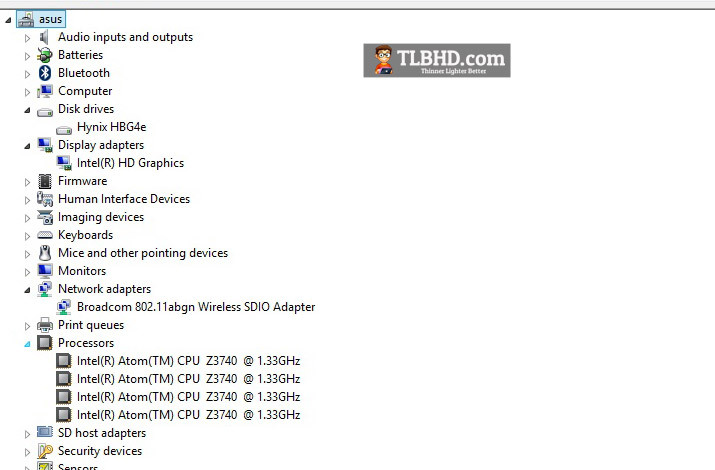 However, the Transformer Book T100TA takes countless hours to charge. Asus packs a 10W charger (5V, 2A) with this one and the microUSB port is used for charging, as I mentioned earlier. As a result, this slate requires at least 4 hours for a full-charge while not using it. If you plan on using and charging it at the same time, it will either charge very slowly (6-8 hours) or won’t charge at all (if you’re performing more complex activities on it). And that’s certainly something Asus should have done better with this device. On top of that, using the device while charging it is really inconvenient, due to the short cable included and the MicroUSB port’s placement on the slate. 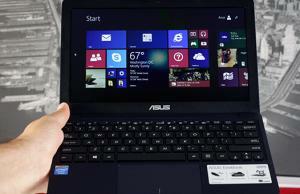 All these being said, you are getting what you pay for with this Asus Transformer Book T100TA. If you need Windows on your tablet and you’re on a tight budget, this device should meet most of your demands. For $400 though, you can’t ask that much, considering the dock is included. There’s also the $350 version, the one with 32 GB of internal storage, but that leaves too little room for your own content, so I’d personally rather buy the 64 GB model for $50 extra (or even less these days). 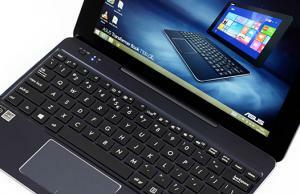 Of course, the TB T100 is not the only BayTrail slate out there, or the only 2 in 1 mini laptop either. Dell, Acer, Lenovo and a bunch of others all have their own offerings in stores, some better, some worse, but most of them more expensive then Asus’s device. We’ll talk more about them in some future post, so stay tuned. 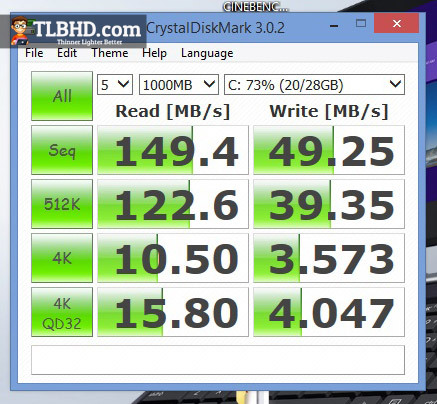 Wrapping this up though, the Transformer Book T100TA is an overall capable little machine. There are things that Asus could have done better, but in this price range, you’ll struggle to find a an overall superior device. That, again, if you want a compact and affordable Windows tablet. Otherwise, if you’re just in a market for a tablet, don’t care about the keyboard or the Windows OS, there are better ways to spend $400 for a brand new tablet these days. There’s a new version on amazon of that t100ta what’s the difference ? 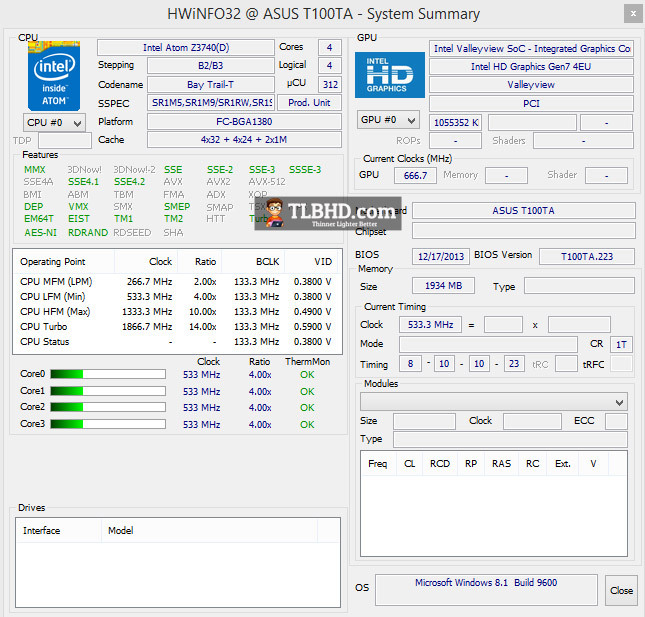 Andrew the new version runs a slightly faster core 1.47 ghz I think. But it doesn’t come with office home and student anymore. Instead it comes with 1 year of office 365 which I feel is sad. 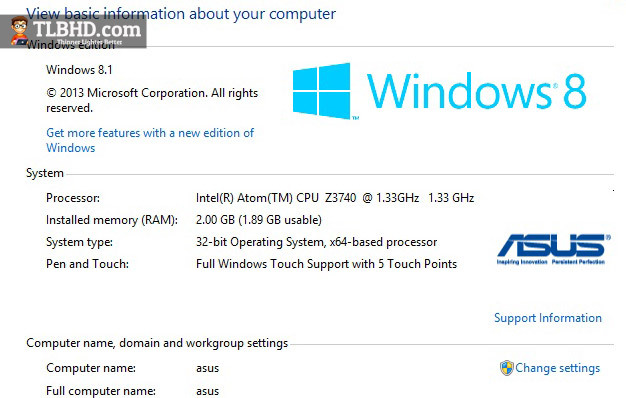 The new version is called asus t100tam I think. Very good and helpful review. 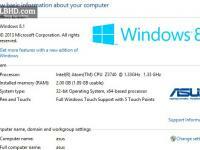 I have just bought a T100TA 64G + 500G, Intel Atom Z3740 Bay-Trail at a special offer @ USD410 (HKD3180) with standard 2 years warranty and a license for Office Home and student. The charging cable is 1.80m and the adapter is 3A. charging seemed fast(er). So far I am impressed. I needed some scans to do and it work smooth and nice, over 50 scans of various documents. The screen is better then expected. I installed EOS utility and remote control with my Canon 6D is slow. That is a bit of a disappointment but I think an android smaller tablet is a better solution anyway (just for this particular use). I’ll post more once I get to test more. Hi Tibi. Nice to hear about that improved charger, I really hated the one on my model. The charging is fine. I used it the whole day but I did not write down numbers. I have installed Lightroom 5 and it runs very very decent. I have installed the codec for Canon RAW files and can see them with the build in Win picture viewer. Faststone works perfect and fast. WIFI was with no issues so was listening connected to Bluetooth on my Sony speakers. I have activated MS Office and that was good too. Once installed the Adobe Acrobat I could create a .doc file with several images inserted in and exported as PDF with no issues. The HD aspect ration si a bit odd for me (I used iPad previously) in portrait mode but rocks for watching videos. An OTG cable on the microUSB port allows to flawlessly connect a mouse, card readers etc. Hy,Well,i was asking my self if it was better to take a T100 with 500gb or a T200 + 500gb,wich one will have a better batery life? I did not like the size of T200. Seemed to have too much frame around the screen and it was heavier. I also did not like that the model offered here was only 32G opposed to 64 for the T100. 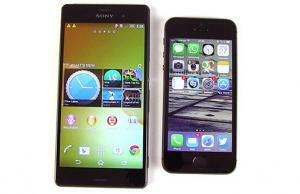 The resolution is the same so it has a lower pixel density. I want that tablet because I need to use Excel and I read a lot, especially PDFs. It seems that one can handle easily with Excel, but I really doubt about the experience of reading, even because I never see someone using it in portrait mode! How does it goes in that way? I use a Nexus 10 tablet for reading, and its quite okay, but I need also a light computer to take into archives and do my job (I´m a Historian). The HD (16:9) aspect ratio makes it cumbersome to read in portrait. I find it very useful to travel and can easily work with word doc and excel. I bought a micro USB OTG to hook mouse or other USB devices when i have it only as a tablet. However for traveling I usually take it with the keyboard / HDD. I even used Adobe LR on it. The great advantage is also the micro HDMI cable. While travelling again I can hook it to HD TV. Thanks! It´s true, reading in it it´s note the most pleasant thing, but I´m handling with that.